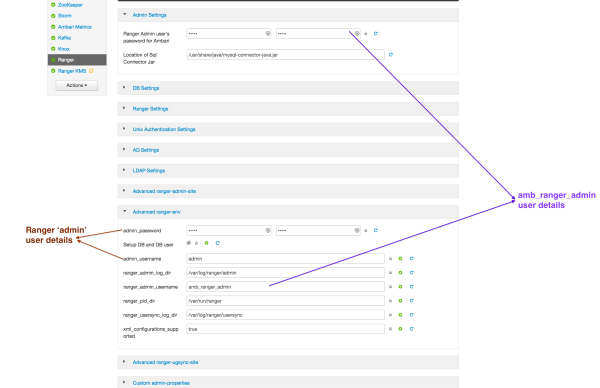 For certain users, if you update the passwords on the Ranger Configs page, you must also update the passwords on the Configs page of each Ambari component that has the Ranger plugin enabled. Individual Ambari component configurations are not automatically updated -- the service restart will fail if you do not update these passwords on each component. Ranger Admin user -- The credentials for this user are set in Configs > Advanced ranger-env in the fields labeled admin_username (default value: admin) and admin_password (default value: admin). Admin user used by Ambari to create repo/policies -- The user name for this user is set in Configs > Admin Settings in the field labeled Ranger Admin username for Ambari (default value: amb_ranger_admin). The password for this user is set in the field labeled Ranger Admin user's password for Ambari. This password is specified during the Ranger installation.